bookshelf, so I put in a last minute order on Shutterfly and here we are. renovations on the cheap. Dramatic readings of Harry Potter. 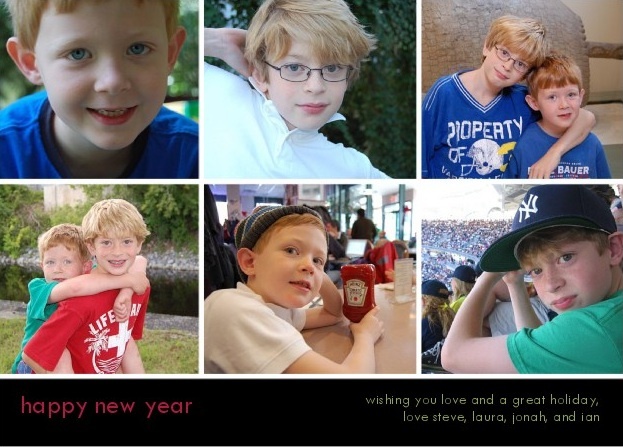 Lots of love, Laura, Steve, Jonah and Ian. 2. We always said “Thick as thieves,” but maybe that’s a South-Jersey thing. Neither way makes much intuitive sense to me. Sweet card. Happy New Year. And thanks, flubber. Happy New Year to you, too.